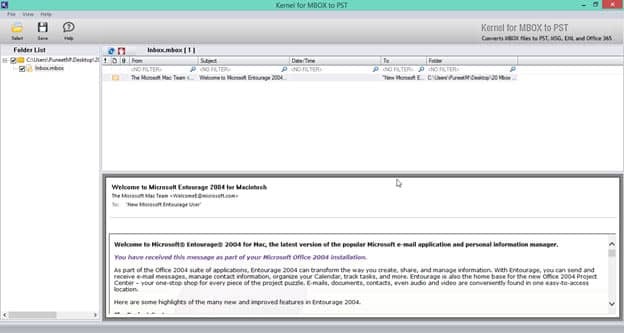 Microsoft Entourage is also an email platform that came into existence in 2000. Apart from emailing platform, this platform facilitates accessibility to the user with the address book, task list, notes list, project name and much more. The performance of the platform is quite satisfactory, but with the change in technology, users have migrated themselves form Entourage to Outlook. The other factor of such migration is frequent occurrence of errors while processing the Entourage files. The errors occurring can be easily identified with their appearance. If the error appears without the text, then it is very clear that it is coming either from the Server or Operating Server. However, there is a proper ways of dealing with such issues. 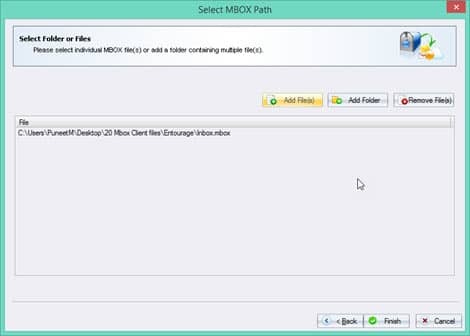 In fact, the best alternative is conversion of MBOX files of Entourage to PST format. It is best facilitated by the external tool that has been dedicatedly designed. 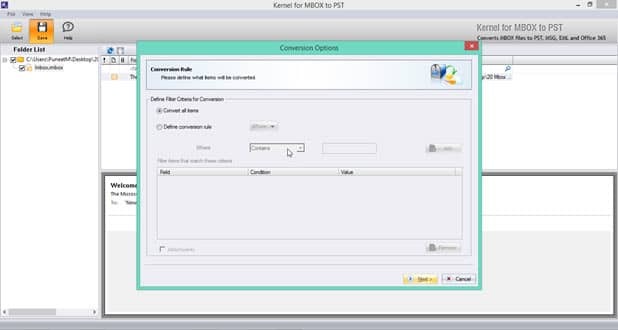 Keeping performance as the critical measure, most professionals prefer to work with Kernel for MBOX to PST to convert the concerned files. 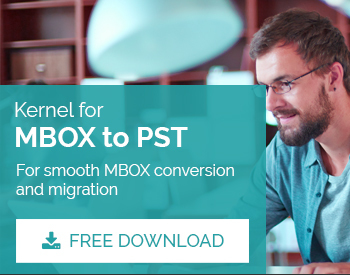 Open Kernel for MBOX to PST platform. 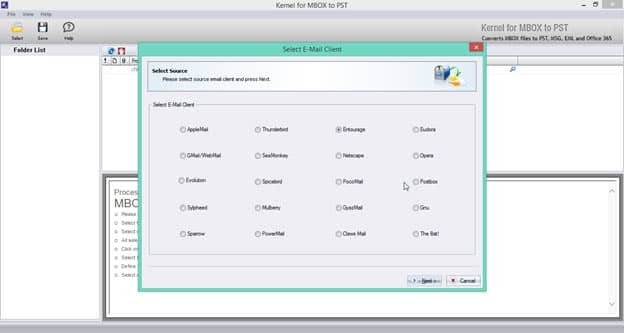 Select the MBOX client. In this case, user must click ‘Entourage’ followed by Next. 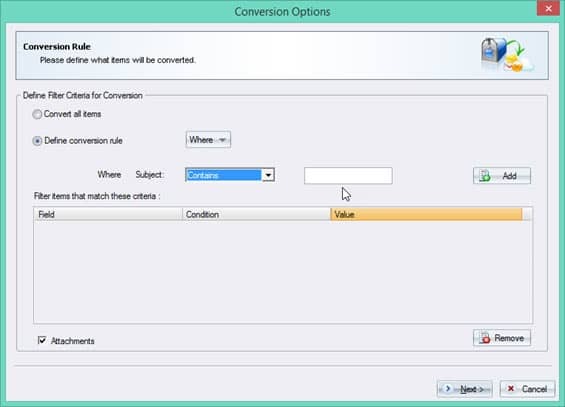 Click ‘Add File(s)’ or ‘Add Folder’ to be converted into PST. If any Entourage MBOX file is to be removed, then it can be simply done by clicking ‘Remove File(s)’. Once the concerned Entourage MBOX files are added, click Finish. Now, the interface of the tool displays the inbox content stored in the right side of the screen. On clicking the inbox folder, the related details will be displayed on the left hand of the tool’s interface. To save the obtained results, user has to click the ‘Save’ button located on the top of the screen. 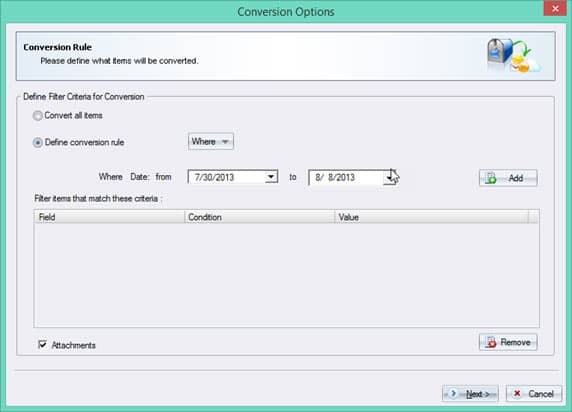 To simply migrate the items entirely, click ‘Convert all Items’. 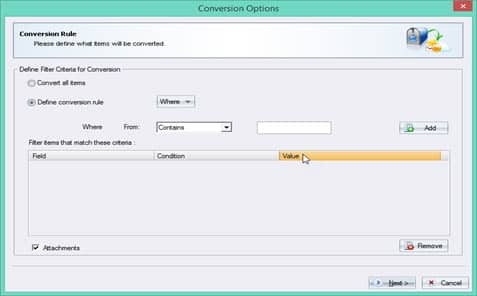 To perform selective migration and to define conversion option, click ‘Define Conversion Rule’. When ‘Convert all Items’ is selected, a user has to simply click ‘Save’ and with few other steps the concerned Entourage MBOX files will be successfully converted into PST. However, if user choose ‘Define Conversion Rule’, then few more specifications must be selected. This selection is made from the drop down menu that reads ‘Where’. It provides four available options, namely: From, To, Subject and Date. In the ‘From’ field the specific value must be entered that may or may not contain the attribute in the From field. Fill the required entries in ‘To’ field. The entries in the ‘Subject’ field must be made, if the need arises. In the next, ‘Date’ field a user has to select the date range. Click ‘Add’ button to add the filter criteria. Note: The tool provides ‘Remove’ button to delete any of the filter criteria when not needed. Simply select the concerned files and click ‘Remove’. Select the ‘Attachments’ checkbox when the attachments are needed to be converted with the concerned Entourage MBOX Files. Once done click ‘Next’. A new window appears that gives different options to convert the Entourage MBOX files to PST, EML, MSG and Office 365. Select ‘Save in PST’ to save the MBOX files of Entourage to PST. 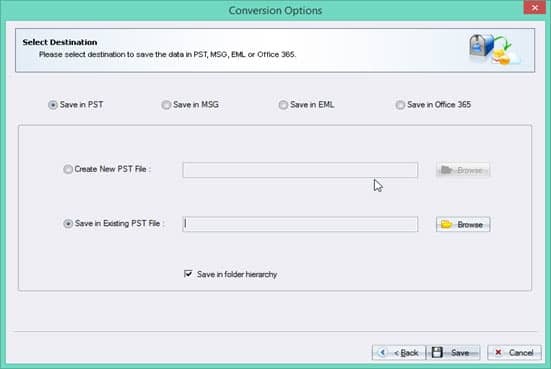 Note: A user has to select from the either of the given option ‘Create New PST File’ or ‘Save in Existing PST File’. To create new PST file, just click ‘Create New PST File’. Click ‘Browse’ to give the path to the newly formed PST files. To save the converted Entourage MBOX files to the pre-existing PST files, then select ‘Save in Existing PST File’. Click ‘Browse’ to provide the dedicated PST file path. Just click ‘Save’ button to save the converted file. Upon successful completion of the saving procedure, a message will appear on the screen. How to Migrate Thunderbird to PST?